If you are in healthcare, you are aware that population health management is a very popular buzzword right now. Search for videos on Population Health Management on You Tube and you’ll find 38,000 to watch; search for #populationhealth on Twitter and you’ll have plenty to read. So the phrase is hot. But what does it mean? Do you know? I share a guest blog on the Primaris website next week that will explain some of the source of confusion. These buzzwords represent different pieces of the population health management puzzle. But instead of examining the pieces of population health management, let’s look at the whole. In the US the change in focus to population health will be a gradual change in how we will plan for and deliver care. Some will say this is a radical change. This change is from our current care focus on treating a single disease to helping whole people maximize their state of health and well being, and to helping whole groups of people to be their healthiest. We’ll move from treating the diabetic in room 11, to helping Mrs. Smith be her healthiest, to ultimately improving the health status of all the citizens of Healthy Town, USA or however we define our service reach or population. Whole care is more than just treating one disease at a time. And it’s also more than coordinating care for a patient with multi-morbidities. It’s about providing complete care through the spectrum of health. o and finally, to provide care that treats as well as manages the complications of disease. These categories of primary, secondary, and tertiary prevention cover the spectrum of care. Primary prevention has been somewhat neglected in clinical settings. The most common primary prevention activity in clinics is the delivery of immunizations. There are other primary prevention activities people can engage in like exercise and healthy diet, but social actions like education and jobs and sanitation also help people stay well. Secondary prevention is the early detection of disease to intervene before it has an impact on a person’s life. These activities are often labeled as prevention in the health care system, activities like mammography and colonoscopy. But because they don’t prevent the disease, just find it early, they are technically secondary forms of prevention. Their goal is to find the disease early enough to prevent the pain and suffering of advanced disease and to sometimes offer cure. Tertiary prevention is where healthcare in the US has focused and excelled. It seeks to delay the progression of disease and manage its consequences. The whole care of population health management will cover this whole spectrum, keeping people as healthy as they can be and minimizing the consequences of any disease they develop. Part of Obama Care requires that medical insurance companies use at least 80% of the premium they charge you to pay for your medical care and for quality improvement expenses. If they don't, they have to refund you the difference. This requirement means that the government has to collect data from medical insurance companies so that the companies can prove they spent your premium for your care and to improve the quality of your care. This data is freely available to anyone who wants to evaluate it. Mark Hall and Michael McCue did just that and they present their analysis in a Commonwealth Fund Issue Brief. The data for the analysis came from those medical loss ratio (MLR) forms filed with Centers for Medicare and Medicaid Services (CMS) for the year 2011 and the authors limited their analysis to insurers with enrollment of 1,000 or more people. The authors share some interesting summary statistics from other CMS reports including a list of insurance companies owing rebates, and a nice summary of average rebate by state. Collectively, insurers had to pay out over 1 billion dollars in rebates for the 2011 year, reducing administrative expenses and profit margins by that amount. 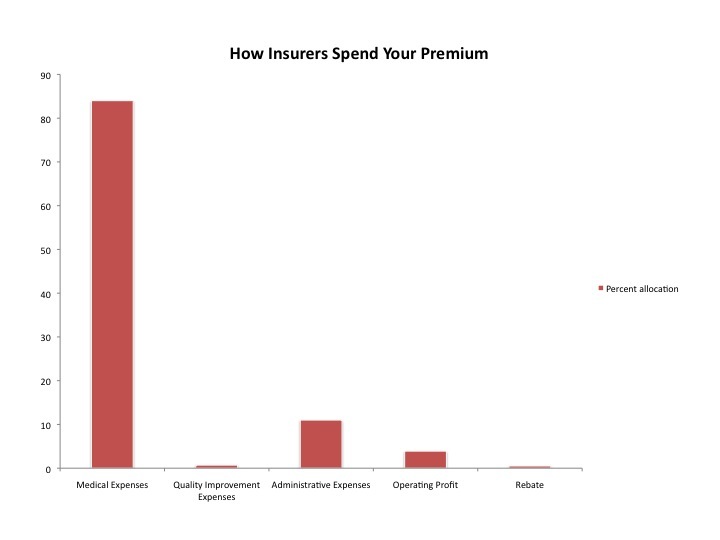 But one of the authors' most interesting findings is how the insurance companies spend your premium. They present this data in a pie chart. I recommend you take a look at Exhibit 1 in their report. I've also put that data into a bar graph. Can you find the expenditure on quality improvement? Click on the graph to see the full image. The authors report that insurers spent $29.04 per person on quality improvement. Quality improvement includes such things as health information technology expenses ($4.88 per person) as well as improving outcomes ($14.92 per person), reducing hospital readmissions ($2.55 per person) , patient safety ($2.94) and wellness activities ($3.74). This is the first year such data is available. It will be interesting to monitor to see if medical insurers choose to invest in improving the quality of the care they purchase for you.